The Five Best Compact Cameras with Viewfinder! With mirrorless cameras and DSLRs becoming more and more prominent in the market, some might think that the humble point-and-shoot can’t stand up to the challenge. Of course, DSLRs and mirrorless cameras are definitely a lot more versatile compared to compact devices. But there are lots of great benefits to having a good quality point-and-shoot in your arsenal. In this article, we will be looking at the Best Compact Cameras With Viewfinder. Ideal for travel, casual photography, and simple documentation of different events and memories, the compact camera can definitely still find a place in your photography arsenal especially if you’re a casual user. In the market to find the best compact cameras with a viewfinder? Let this list be your guide. First up in our search for the best compact cameras with viewfinder. In your search for the best compact cameras with a viewfinder, it’s impossible that you won’t come across the Sony DSCHX80/B High Zoom Point and Shoot Camera. With one of the best sets of features in the market, this camera is also praised as one of smallest available. So it really makes a great companion if you want to have a reliable camera on hand whenever you need it. In terms of image quality, the Sony DSCHX80/B comes equipped with an 18.2 megapixel CMOS sensor that allows the device to generate high-quality images with minimal effort. It also performs very well in low light, so you can confidently shoot in a number of different situations without worrying about brightness issues. The LCD screen on the camera completely flips out so you can take seamless selfies minus the need to keep checking whether you’ve taken a good shot. To share those self-portraits, the camera can readily connect to your smartphone or laptop by way of Bluetooth or WiFi. The viewfinder on the device is a retractable OLED Tru-Finder Viewfinder that accurately and precisely represents what’s in front of the lens. This makes it the ideal device if you want something that allows more control over your capture as using the viewfinder can help you get the perfect picture without all the guesswork. Compact design makes it easy to slip the device into your pocket so you can take it virtually anywhere with you. Easy file transfers via Bluetooth or WiFi makes for problem free file management. Excellent performance in low light conditions lets you take pictures in a variety of shooting situations without the need to optimize lighting. Retractable OLED Tru-Finder Viewfinder gives you superb control over your captures. Does not use a touchscreen which makes the process of adjusting settings and navigating the device a little tedious. Next up in our search for the best compact cameras with viewfinder. They say that some of the best compact cameras with viewfinder come from the Canon brand, and with the Canon PowerShot G5 X Digital Camera, that proves to be true. This device boasts some pretty impressive features that make it compete closely with more advanced camera options that come with sophisticated functionality. Firstly, the camera uses a 20.2-megapixel sensor that works alongside a DIGIC 6 image processor. These two components come together to create a highly sensitive camera that can easily pick up on impressive detail for clear, crisp, and sharp image quality. In terms of controls, the PowerShot G5 X is definitely a winner. The seamless navigation makes for unrivaled ease of use, eliminating the need to tinker with confusing settings. This is one of the main features that people look for in a point-and-shoot because they’re often intended to operate without a fuss. Lastly, the viewfinder on the PowerShot G5 X is another impressive feature. With 2.36 million dots, this electronic viewfinder gives you the best possible representation of your shot before you even click the shutter. With this, you can reduce the number of shots you take, optimizing each effort so you get nothing but perfect results with each snap. All things considered, it can definitely pass off as the best Canon compact camera with a viewfinder. 20.2-megapixel camera is powerful and sensitive, capable of capturing great detail with impeccable sharpness. The user interface is simple and seamless, eliminating the confusion associated with figuring out more flustering choices. The viewfinder uses 2.36 million dots, giving you a clear and accurate representation of your subject. Vari-angle touch screen makes it easier to capture self-portraits or vlogs without losing sight of yourself. Quite a bit more expensive than other options, which makes it one of the priciest compact cameras available. Next up in our search for the best compact cameras with viewfinder. 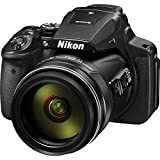 The very best Nikon compact camera with a viewfinder based on our research and experts’ opinion is the Nikon COOLPIX P900 Digital Camera. The gadget is one of the most powerful on our list, blurring the border between typical point and shoots and more powerful DSLR cameras. At a glance, the device definitely looks like a professional camera. But it does fall within the range of compact cameras. It features an ultra-sensitive lens with the capacity to zoom up to 83x which is one of the most powerful zooms on a compact camera in the market today. This means you can get up close and personal with distant subjects without having to move from your spot. The built-in lens features a telephoto focal length, which makes it ideal for portrait photography and to some extent, dramatic wide-angle captures. The device also boasts swiveling vari-angle display which makes controlling the device easy and problem-free. The viewfinder on the device is a high-resolution eye-level viewfinder that’s built to give you the best possible representation of your capture before hitting the shutter button. For shutterbugs who want to take more control over their shots, this can be particularly helpful as it provides a more accurate preview of your subject. 83x optical zoom is powerful and crisp, allowing you to zoom in on very distant subjects without losing image quality. The telephoto focal length makes for impressive portrait photographs and dramatic wide angle shots. Robust construction promises to keep your device safe from wear and tear even with daily use. High-resolution viewfinder allows you to take full control of your shots before you hit the shutter button. LCD display swivels out at various angles to help you capture images from a variety of perspectives. Takes a while to focus. Doesn’t use a reliable image stabilization system, so distortion is common for zoomed in settings. Next up in our search for the best compact cameras with viewfinder. Compact cameras are often patronized because they’re effective, efficient, and affordable. True enough, these devices rarely ever cost as much as DSLRs or mirrorless cameras, so they do make a suitable choice for people who want to work within a budget. While there are a lot of different options available, the best and most affordable compact camera on our list has to be the Panasonic Lumix ZS50 Camera. Sleek, slim, and classy, the device boasts a very impressive aesthetic that makes it a great choice if you’re looking for something you can carry around with pride and confidence. The manufacturers decided to go with this unique and almost vintage style as a tribute to the device’s lens which comes from the Leica brand. With enhanced low light sensitivity, the camera can perform pretty well even in the worst lighting settings. This is made particularly easier with the high performance viewfinder which helps users see their subject in clear detail even during low light shooting conditions. Some other features of the device that make it one of the best compact cameras with viewfinder include its manual focus, high-speed video, time lapsing, hybrid OIS, and full HD video recording which extends the versatility of the device to give you more options when exploring what you can do as a casual photographer or a beginner. Pleasing aesthetic makes it something of an accessory that you can proudly wear around your neck. Comes with a high-performance Leica lens that gives a subtle vintage touch to your captures. Enhanced low light sensitivity means you can capture stunning images with little effort even in poor lighting conditions. Feature-rich operations mean you can experiment with a variety of settings to step-up and improve your skills. Easy user interface reduces the learning curve and eliminates confusion. Not exactly the most durable camera on the market, requiring a bit of care and caution to prevent wear, tear, and damage. Next up in our search for the best compact cameras with viewfinder. The last camera on our list of the best compact cameras with viewfinder comes from the Fujifilm brand. In the past, the company was best known for their instant film cameras which are still popular in the market today. But recently, the brand has come out with a variety of point and shoots and even mirrorless cameras that have given competitors a run for their money. Based on our research, the best compact camera from the Fujifilm brand is the Fujifilm X100F APS-C Digital Camera. Boasting an array of features and functions, the device proves to be one of the most powerful point-and-shoots available, giving you superb image quality and ease of use that can definitely compete with more advanced camera options. The X100F features a 24.3 megapixel CMOS III APS-C sensor which is highly sensitive to capture fine detail and clarity. This, in combination with the device’s whopping 91 point autofocus system, makes it a champ in terms of locking in on your subject to give you superb image quality. Controls-wise, the X100F is nothing short of a dream. The camera features two knobs that easily control most of the settings, allowing you to choose the specifics you need in order to get the right shot minus all the guesswork. This blends seamlessly with the device’s clean and classy aesthetic which is nothing short of good looking, to say the least. The viewfinder on the device is a hybrid that combines the features of an optical viewfinder and electronic viewfinder to give you a versatile tool that makes the camera easier to use on the overall. The LCD screen on the device is equally powerful and impressive, providing you crisp, clear detail with the most accurate image representations so you can really see what your lens has captured. Probably the only downside to the Fujifilm X100F APS-C Digital Camera is the fact that it does come at a pretty hefty price. At upwards of a thousand dollars, it may very well be as expensive as a lot of other DSLRs or mirrorless cameras on the market. 24.3-megapixel sensor is accurate and sensitive, capturing impressive detail with minimal effort on the user’s end. 91 autofocus points mean your subject will always be in sharp detail in the fastest time possible. Hybrid viewfinder extends control so you can get the perfect shot with each try minus the need to keep checking how your images came out. Durable construction is also aesthetically pleasing, standing up to the challenge of daily wear and tear with superb integrity. Definitely not the cheapest camera available, costing as much as a DSLR or a mirrorless camera device. The best compact cameras with viewfinder can be hard to find because there are a lot of choices available on the market. The trick is understanding what each feature is for and whether it’s something that you’d be able to leverage to help step up your photography game. So in your search for the best of the best compact cameras in the market, make sure to keep this list in mind! These high rated choices are some of the most popular available, and they definitely offer impressive and efficient features and functionality that make them worthy choices for any discriminating buyer. We hope this has has helped you find the best compact cameras with viewfinder on the market. The Five Best Nikon Lens for Wedding Photography! The Five Best Cameras for Hiking!